Wow, I am desperately in need of some male birthday cards. So glad I have these new stamps from Great Impressions! 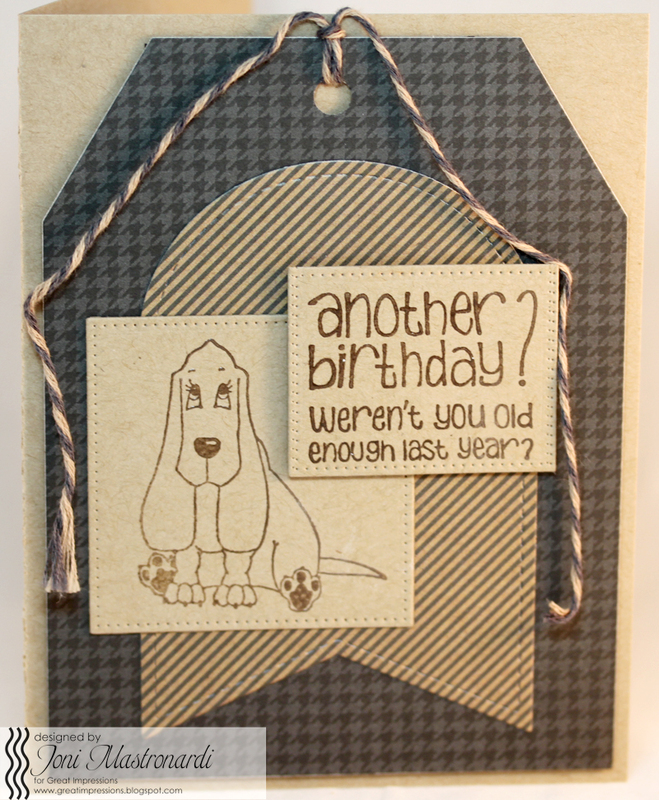 I stamped the E870 Hound Dog with brown pigment ink and heat embossed the image. I used a square die to cut out the focal image. I added the setniment D503 Another Year, also stamped with brown embossing ink and heat embossed. I used a banner and tag die to frame the images. Check out the new release from Great Impressions! Cute as can be, Joni! I'm always in need of man cards - what a great idea! I must remember to try this - thanks for sharing! Love this card. What a great masculine card. I love the monochromatic look, especially for men. Thanks for the inspiration.